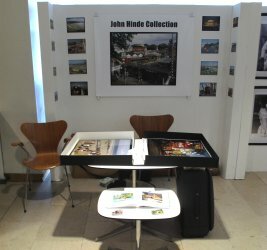 We've returned from the Vintage Festival 2011 - it was great to share the John Hinde prints with people who knew the postcards and to share the story with those who didn't. One question we were asked quite a lot was the actual date of many of the prints, which unfortunately wasn't recorded at the time of photographing them. We have a friend who did a bit of research on the date of the Piccadilly by Night print and he deduced that it could be 1965. One of the ads is for Redifusion and they started in London in 1964. The newspaper in the bottom right states 'Bandleader in Death Crash'. The American bandleader Spike Jones died in 1965. So thanks for that Nick! Any other information of any of the prints would be gratefully received. 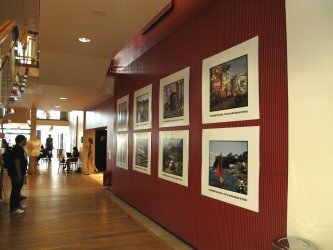 Finally we have some pictures of the John Hinde Collection in the Royal Festival Hall as part of the Vintage Festival 2011.